A rare late 16th to early 17th century early map of Borneo and neighbouring islands, in beautiful old colour from Theodore De Bry’s (1528-1598) edition of Olivier Noort’s Description du Penible Voyage Faict entour de l’Univers ou Globe Terrestre, originally published by Cornelis Claes in 1602, the first printed account of Van Noort’s voyage, which would later be reprinted by De Bry. 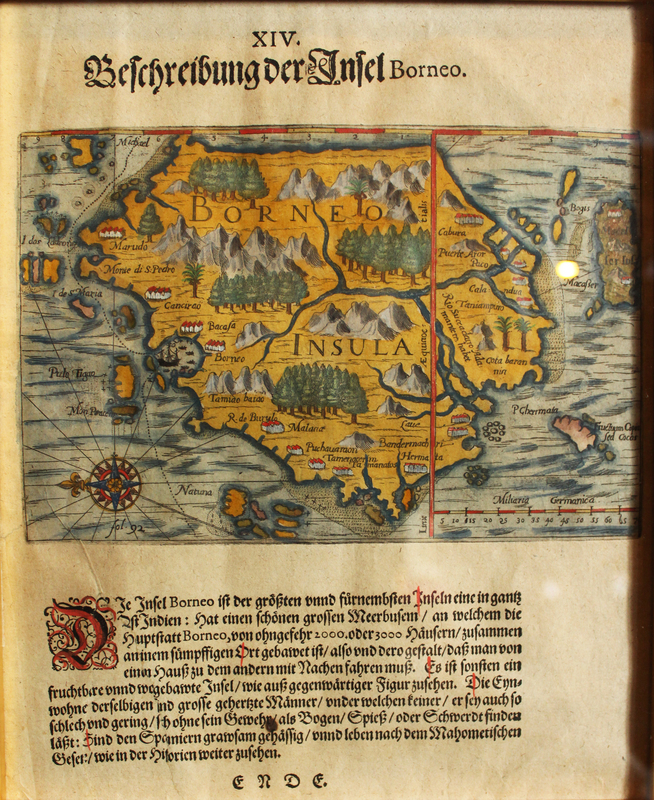 One of the earliest maps of the complete island of Borneo. The map depicts Van Noort’s ship in the large bay of Brunei. Van Noort relied upon Chinese pilots which he had employed to serve as ambassadors to the Sultan, who had to be persuaded that the Dutch were not the hated Spanish. The map depicts local boats clustered around Van Noort’s vessel, which is a reference to the roughly 100 native proas which surrounded the ship when it attempted to set anchor on January 1st, 1601. Van Noort’s account of the island follows after Pigafetta’s account and is one of the earliest European accounts of this important island in the region. Olivier van Noort was the first Dutchman to circumnavigate the world, leaving Rotterdam on July 2nd, 1598 with four ships and a plan to attack Spanish possessions in the Pacific and to trade with China and the Spice Islands. He initially landed at Rio Di Janeiro in Brazil but was driven back, and along the coast suffered many losses by the attacks of the Indians. He resolved to winter on the deserted island of Santa Clara and then set sail again on June 2nd, 1599. On June 29th, 1599, he discovered an island near the coast of Patagonia, and stopped there to repair damages. On November 23rd, 1599, he entered the Strait of Magellan, and landed on the northern coast where he was attacked by Indians and again suffered many losses. Soon afterwards he anchored among the Penguin Islands, and subsequently discovered the Bays of Olivier, Mauritius and Henry but could not the latter on account of the ice. In February, 1600, Van Noort and the remaining crew left the Strait of Magellan and, entering the South Sea, sailed along the Chilean and Peruvian coasts, pillaging and burning as he went, and capturing several Spanish ships. The Viceroy, Luis Velasco, sent a fleet to capture him but Van Noort had already set sail across the Pacific in the direction of the Ladrone Islands. He pillaged the Philippines, visited Java and Borneo and, sailing round the Cape of Good Hope, arrived back in Rotterdam on August 26th, 1601. Van Noort returned to Rotterdam with only his last ship, the Mauritius, and 45 of his original crew of 248 men. The venture barely broke even but was the inspiration for more such expeditions. The United Dutch east India Company (VOC) was formed a few months later. Van Noort’s Description du Penible Voyage Faict entour de l’Univers ou Globe Terrestre, provides his account of the voyage, including a detailed account of the coasts of Brazil, Argentina, the Straits of Magellan, Chile, Peru and the subsequent Tras-Pacific crossing. The maps and views, engraved by Baptista Van Deutecum and Benjamin Wright, are among the earliest regional printed images of the areas shown.